The IDTech UniMag Pro is a magnetic stripe reader that communicates with mobile devices via the headphone jack. Use your mobile device to read a variety of magnetic stripes, including credit cards, signature debit cards, gift cards, loyalty cards, driver's licenses, and ID badges. The UniMag Pro utilizes IDTech's proven MagStripe reading technology, providing bi-directional card reading of up to three tracks of information. With a guaranteed operating life of at least 100,000 card swipes, the UniMag Pro offers exceptional card reading capabilities in a durable form factor. The IDTech UniMag Pro allows merchants to provide their customers with another acceptable method of payment, and with the capability to swipe credit cards, merchants can save money by avoiding costly card-not-present fees. 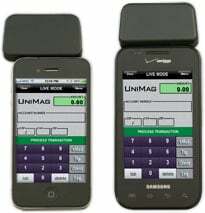 With the UniMag Pro, merchants can accept credit card payments wherever they go. ID Tech ID-80110004-001 Credit Card Reader. ID Tech UniMag Pro mobile reader, apple iphone/apple ipad/android compatible. Reads tracks 1, 2, & 3. Worked out of the box for me. I'm a little concerned about the audio jack connection but has been working fine for me.